The football federation of Macedonia awarded the best in the Macedonian football for 2008. Goalkeeper Tome Pacovski is the best football player, Rabotnicki is the best club, while Dragoljub Bekvalac the best coach. The Macedonian football federation awarded the best from the Macedonian football federation in 2008. 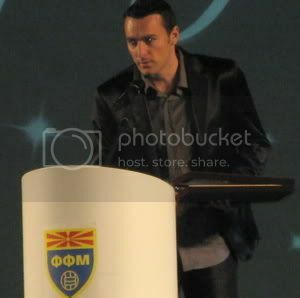 Tome Pacovski, current FK Vardar member, captain of Rabotnicki when the club won the double title last year and a regular member of the national team was named as best Macedonian football player. Adriano Miranda was one of the best players for Pelister last season when they finished third on the table and won the award for best foreign player in Macedonia. Rabotnicki won the two titles last season while Serbian coach Dragoljub Bekvalac was in charge and they earned the awards for best club and best coach. Goran Pandev is undoubtedly the best Macedonian player that plays abroad, while Gligorovski's 16 goals from last season brought him the goalscorer award. Shkiponjat without a competition got the award in the women football, while Natasa Andonova with the excellent performances for the women national team u17 and u19 and for her club, deserved the best female footballer award. For special motivation and talent an award will receive young players Ilija Nestoroski (FK Pobeda), Emir Sabani (FK Rabotnicki) and Dragan Georgiev (FK Turnovo Horizont). A special recognition will be given to Zoran Boskovski "Coko" and Andon Doncevski for the jubilee of 15 years Macedonian football. The visitors of FFM's website chose the best 11: Petar Miloshevski – Nikolce Noveski, Igor Mitreski, Goce Sedloski, Robert Popov – Veliche Shumulikoski, Vlatko Grozdanoski, Darko Tasevski – Goran Pandev, Ilco Naumoski, Goran Maznov.